Nick Kyrgios said he has learned to keep his mouth shut after the controversy surrounding his recent on-court comments. The Australian, 20, was fined and given a suspended ban for remarks made about Stan Wawrinka's girlfriend last month. Kyrgios lost 7-5 6-3 4-6 6-1 to Andy Murray at the US Open on Tuesday - his third match since playing Wawrinka. "I'd like to think that I'm going to learn from it. I think I have. 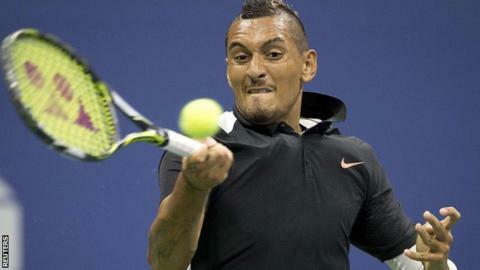 I think I'm on the right path," said Kyrgios. "Kyrgios played with passion and flair, but a penchant for the spectacular ultimately contributed to his undoing. Murray was too good for the Australian for the third Grand Slam this year, even if he did have to save 11 break points and was helped by Kyrgios' inability to refuse the low-percentage through-the-legs winner. It was a very searching first-round test, which Murray passed with distinction." Asked to be specific about what he had learned, Kyrgios added: "Keep your mouth shut at times." Kyrgios was given a suspended 28-day ban and fined $25,000 (£16,200) by the Association of Tennis Professionals (ATP), to be imposed should he transgress again. That punishment only applied to ATP events, however, so was not in effect at the US Open. The world number 37 was well received by the crowd at Flushing Meadows but understood "100%" why some spectators had jeered him at his previous matches. He said: "There are still people in the crowd that are unhappy with what happened. And that's only normal." Murray, 28, had previously been among those to call for understanding towards Kyrgios as a young player in the spotlight. "I've had a really good relationship with Andy for a long time now," said Kyrgios. "I've played him a lot. Never beaten him. I got a set off him today, so I'm making progress. He's always had nice things to say about me. We've had a lot of conversations on Twitter and stuff. "Whenever I've needed something, I've come to him. I've sort of looked at a guy like him that's a really good role model for everyone." Wawrinka, 30, also played in New York on Tuesday - beating Albert Ramos 7-5 6-4 7-6 (8-6). He was later asked for this thoughts on the ATP punishment handed to Kyrgios. "They took a decision, and that's it," said the Swiss. "You know, I don't care much about that any more."